Using a flexible vendor interface and sourcing high-quality market data enables us to flexibly and quickly develop new trading strategies. We develop new trading strategies on basis of comprehensive historical price series. Using real-time prices from a stock exchange, we generate trading signals for a new strategy over a long period of time. This is to validate the results of the design phase. 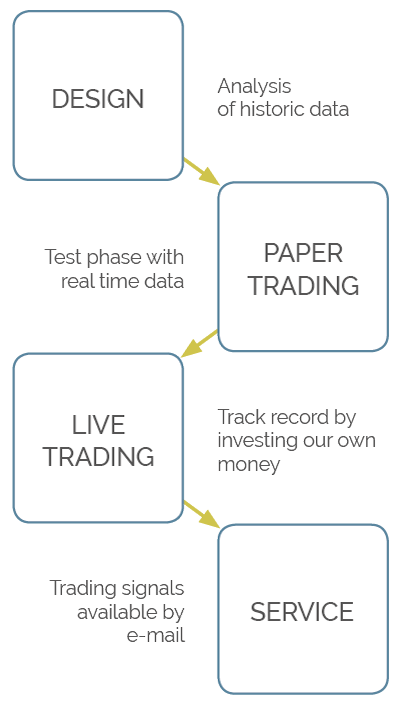 In live trading, we check whether a trading strategy can be successfully implemented on the capital market. After the live trading phase, we offer trading signals for the strategies to its clients, which passed testing and quality control. OUR TRADING STRATEGIES FOCUS ON SUSTAINABLE RETURNS.